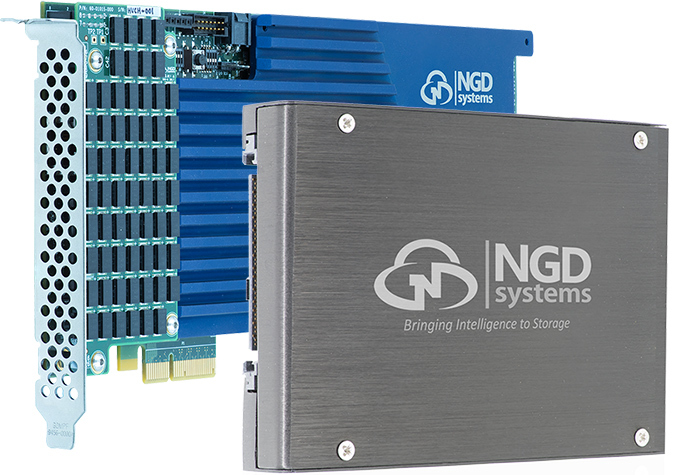 NGD Systems has announced its second-generation SSDs that feature compute capabilities. The Catalina 2 drives come in both 2.5-inch/U.2 and add-in-card form-factors, and are aimed at high-density servers for artificial intelligence (AI), machine learning (ML), and computer vision (CV) server applications. The drives feature 16 TB – 32 TB capacities depending on the form-factor and use 3D TLC NAND memory. On a high level, NGD’s Catalina 2 drives are NVMe 1.3-compliant SSDs featuring a PCIe 3.0 x4 interface and based on Toshiba’s BICS3 3D TLC NAND memory. It is noteworthy that NGD’s architecture supports any 3D TLC flash and is 3D QLC ready, so the manufacturer can adopt any type of flash and is not dependent on its supplier. In fact, the AIC versions of the drives rely on M.2 modules that can be switched at any time. U.2/2.5-inch Catalina SSDs will be available in 4 TB, 8 TB, and 16 TB configurations, whereas add-on-cards will support maximum capacity of 32 TB. Peak read/write performance of the Catalina 2 drives can be as high as 3.9 GB/s, but this is not the main selling point of these SSDs. As for power consumption, the U.2 is speced for 12 W (which is in-line with requirements of enterprise-grade 2.5-inch storage devices), while AIC consumes up to 13 W.
Just like in case of the original Catalina drives launched in early 2017, the key features of the Catalina 2 are in-storage processing capabilities (In-Situ Processing), patented Elastic FTL (Flash Translation Layer) algorithm, and a strong LDPC-based ECC (since it is QLC ready, it must feature a strong ECC). The NGD Catalina 2 are based on a recent Xilinx FPGA featuring several general-purpose ARM Cortex-A53 cores along with programmable transistors, and flexible I/O capabilities. 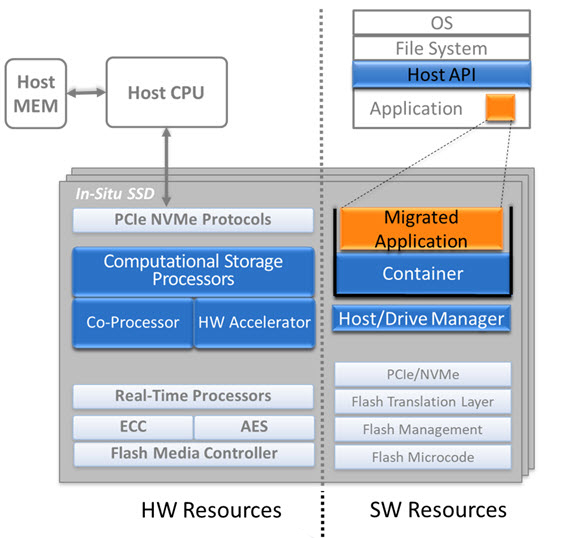 The FPGA runs a micro-OS based on Linux to perform in-storage processing along with flash management, and ECC tasks. Processing data on an SSD enables to perform relatively simple tasks (e.g., search, analyze, etc.) without moving massive amounts of data to host CPU or over a network, which greatly reduces loads on data buses and networks, therefore speeding up processing while reducing overall power consumption of a data center. Because workloads vary greatly, NGD does not like to talk about raw performance numbers of its drives because their value for the end clients does not necessarily depend on it. NGD’s Catalina 2 SSDs are already available to select customers who can tailor their apps to the drives. It depends on how securely it is abstracted away from (or, perhaps, below) the main OS and how secure its interactions with it are. Normally direct access to it should be disallowed, even for admins, since that would mean bypassing all the abstraction and security that has been employed.